Bed Bug Control in Brampton, Mississauga, Ontario, Toronto, Canada and other GTA. Call Now (+1(647)380-1205). Bed bugs have been known as human parasites for thousands of years. Bed bugs adult is oval, broadly flattened blood sucking insect, and possess mall wind pads, or we can say wingless. Bed bugs are usually brown in color before feeding, and become red in color after full blood meal which takes 3-5 minutes to get full blood meal. Under cool conditions, bed bugs have been able to survive up to a year without a meal. They are more active during night when the host is asleep. 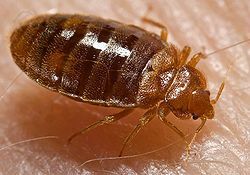 Bed Bugs found in cracks and crevices, including mattress seams, sheets, furniture, behind baseboards, electrical outlet plates and picture frames. Often found in hotels. Economical Pest Control does complete and detail inspection. Our technician assesses the level of pest infestation for example: light, moderate or heavy, and we use this information to decide proper treatment, and if required we give some recommendations for effective management. After treatment we do follow-up within two weeks to assess the effectiveness of our first treatment. In follow-up we re-inspect potential area, if any activity found we retreat your house/apartment/unit/room. Economical Pest Control do complete and detail inspection. Our technician assesses the level of pest infestation and we use this information to decide proper treatment.